The modern economy revolves around the sprawling logistics industry. Nothing demonstrates this more clearly than the current situation at Amazon and UPS. If Amazon makes good on its recent pledge, it will add another 100,000 workers to its U.S. workforce by 2018, making it one of the country’s largest—and one of the largest nonunion—employers. The U.S. labor movement faces several existential threats right now, but Amazon’s is a special kind. The company’s breakneck expansion has revolutionized the logistics industry. Its impact is most deeply felt at United Parcel Service (UPS), the country’s largest private-sector, unionized employer, with nearly 250,000 of its workers represented by the Teamsters. UPS already lashes the Teamsters with the threat of Amazon undercutting the union’s gains to justify the miserable wages paid to part-timers, impossible productivity demands, and the subcontracting of union work to non-union contractors. It will no doubt use the competition from Amazon to demand further concessions from the Teamsters during the next round of contract negotiations. Such a campaign has the potential to take on the package giant, but it can also serve as a beacon for future activists among Amazon’s rapidly expanding workforce. And if socialists in the United States can develop an industrial organizing strategy, we can play an important role in helping to organize some of the most powerful workers in this country. UPS was founded as a bicycle messenger service in 1907 by James E. Casey. Casey, known for his taciturn personality, did few interviews during his long tenure as the company head. Keeping that low profile would quickly prove impossible. The company soon became known as “Big Brown” and developed into a global behemoth. UPS is densely unionized, unlike its almost entirely nonunion twin FedEx. Both are the darlings of the business media. Along with 250,000 members of the Teamsters—mostly drivers and hub workers—UPS pilots are represented the Independent Pilot Association (IPA), and some of its mechanics are members of the International Association of Machinists (IAM). UPS Freight, formerly Overnite transportation, has around about 13,000 Teamsters based in the traditional heavy-duty bulk freight industry who work under local union contracts. The package delivery wing that most people are familiar (with their ubiquitous brown delivery trucks) has over 230,000 members. A majority—somewhere around 55 percent, according to organizers’ independent estimates—of these UPS Teamsters are part-timers whose start pay is an abysmally low $10 to $11 per hour. For three decades, starting pay for part-timers was a miserable $8 to $8.50 per hour. Part-timer poverty, along with brutally high productivity, subsidized UPS’s massive expansion in the 1980s and 1990s. Yet, despite all the logistic services that UPS offers—and the declaration of Jack Levis, UPS’s senior director of process management, that, “We’ve really turned from a trucking company with technology to a technology company with trucks”—it is still primarily a package delivery company. UPS doesn’t manufacture any goods nor it is a retailer. Unlike UPS’s early attempts at flying under the radar, Amazon’s rise has been anything but quiet. Founded in Seattle in 1994, it has become one of the most visible brands in the world and an intimate part of their daily lives of tens of millions of people. Amazon founder Jeff Bezos is the fifth-richest person in the world, worth nearly $72 billion and treated by some with a similar cult-like reverence to the late Apple founder Steve Jobs. Unlike the taciturn Casey, who lived and died in a cloistered world of UPS, Bezos is a highly visible public figure. He recently purchased one of the most important newspapers in the country, the Washington Post. Billboard actually asked him if he had any plans to run for president. (He said no.) He even made a cameo appearance in Star Trek Beyond. His flair for public relations is well known. Amazon’s promotion of drone deliveries has captured the attention of the general public. The company also was granted a patent Jules Verne-like floating warehouses. My answer is of course it could happen again. It’s all a matter of attitude and the capacity to constantly study and question the management of business. If I were a young man or woman starting out today with the same talents and energies and aspirations that I had fifty years ago, what would I do? … Probably some of kind of specialty retail, something to do with computers, maybe. Walton’s musings strongly hint at the possibility of an Amazon-like company as his successor. But what did Bezos learn from Walmart? Bezos was so enamored by Walmart that he poached a large number of its executives in the late 1990s. Walmart sued in response, arguing that Amazon was stealing its “trade secrets”; Walmart ultimately lost the suit. One of the ideas Bezos borrowed from Walton was working his employees past the point of exhaustion. An early Amazon executive, for example, suggested to Bezos that because parking was so expensive near Amazon’s first headquarters and warehouse in Seattle, the company should subsidize bus passes for its workers. Bezos apparently “scoffed” at the suggestion. Amazon’s working conditions worsened through the two decades of the twenty-first century as it rapidly expanded its warehouses or distribution centers (“fulfillment centers” in Amazonese) across the country. Amazon’s success is due to its massive online retail operation, honed to customer satisfaction on a mind-boggling array of products that few other traditional brick-and-mortar retailers—notably the venerable and declining Sears, which Walmart surpassed in sales in 1989—or other online retailers have been able to compete with. So the announcement in July 2015 that Amazon was valued more than Walmart shouldn’t have come as a total surprise. While Walmart is still the world’s biggest retailer in terms of revenue, Amazon’s evolution from a start-up in a modest office building to a retail juggernaut employing more than 97,000 employees [in 2015] has changed the shape of the retail industry. Walmart pioneered the creation of the modern logistics corporation with the management of entire supply chains, from the manufacturer of consumer goods to their placing on the store’s shelves. Amazon is attempting to do the same thing—without, until recently, the construction of retail stores—with one addition: controlling customer delivery through its own fleet of drivers. If Amazon is able to build its own delivery fleet, its impact on the logistics industry could have the greatest impact on the warehousing and delivery business since the deregulation of the U.S. freight and aviation industries in the late 1970s and early 1980s. Amazon has launched its own air transport network, an ocean freight forwarding company, direct delivery operations, and the myriad of small, barely “independent” subcontractors servicing the final customer delivery of packages. Not since UPS’s frantic efforts to build an air delivery operation to catch up with overnight pioneer FedEx or FedEx’s construction of a freight operation to match its Big Brown rival has a logistics company in so short a time built such a formidable operation. A 2013 report to Amazon’s senior management team proposed an aggressive global expansion of the company’s Fulfillment By Amazon service, which provides storage, packing, and shipping for independent merchants selling products on the company’s website. The report envisioned a global delivery network that controls the flow of goods from factories in China and India to customer doorsteps in Atlanta, New York, and London. The project, called Dragon Boat, is proceeding, according to a person familiar with the initiative, who asked not to be identified because the information isn’t public. Four years later, according to Business Insider, Amazon has 214 logistics facilities across the United States, including fulfillment-center warehouses; sortation centers, where packages get presorted for shipping; Amazon Pantry and Amazon Fresh, which deliver groceries; and Amazon Prime Now hub, a separate building to store one-hour delivery items. Twenty-eight more distribution centers are expected to be built this year. Amazon recently announced that it will invest $1.5 billion to build a massive air hub based in the Cincinnati/North Kentucky (CVG) International airport. “The project will bring up to 2,700 jobs and forty Boeing 767s to CVG, according to officials, with six hundred full-time jobs coming initially,” according to the Cincinnati Business Courier. The air hub is squarely within the region known as “Cargo Alley,” where planes can reach nearly 80 percent of the continental United States within two hours. “We believe Amazon may be the only company with the fulfillment/distribution density and scale to compete effectively with global UPS/FedEx/DHL,” declared a report by Baird Equity Research, a leading financial consulting firm. builds in or close to major cities. Their Kenosha facility (and nobody had built warehouses in Kenosha before Amazon) the workforce is more diverse. Amazon builds in bigger labor markets [like] Chicago, [where] they have fulfillment centers on Goose Island, 28th and Western, Lisle, Joliet, and Morton Grove [both inside the city and in several surrounding suburbs]. Amazon has reversed the model of warehousing pioneered by Walmart. This offers an opportunity to organize Amazon workers, since its drivers interact often with Teamsters drivers. Ken Paff, national organizer of the Teamsters for a Democratic Union, says the lessons of past contract battles at UPS will be important for future organizing during the upcoming contract battle at UPS and for future organizing at Amazon. When the Teamsters won their battle against UPS in 1997, expectations were raised throughout the entire labor movement. Immediately following the strike, activists began talking about organizing FedEx (a campaign that has yet to be successful). A fighting union is the best advertisement for organizing new, nonunion workers. A big contract win at UPS in 2018 will help draw sympathetic union supporters from Amazon to the Teamsters. Eighty-five percent of the nearly three-and-a-half million workers employed in logistics in the United States are located in large metropolitan areas—inadvertently recreating huge concentrations of workers in many of those areas that were supposed to be “emptied” of industrial workers. There are about sixty such “clusters” in the United States, but it is the major sites in Los Angeles, Chicago, and New York-New Jersey, each of which employs at least 100,000 workers, and others such as UPS’s Louisville “Worldport” and FedEx’s Memphis cluster, that exemplify the trend. The organizing opportunities this presents—at both companies—should be clear to the Left. When I spoke to Mark Meinster last year about the many challenges facing organizers in the non-union logistics industry, he thought we needed a spark to ignite organizing efforts. “We need something big like the 1997 UPS strike or the 2006 immigrant’s rights marches.” Do we have that now with millions marching against Trump? 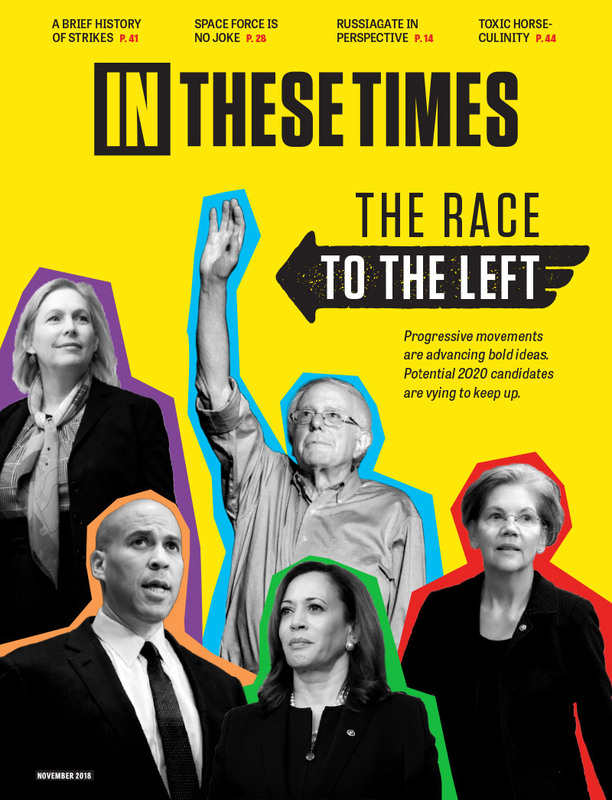 The widespread interest in socialist ideas and the explosive growth of the Democratic Socialists of America (DSA) shows that there is a generation willing to fight for greater political change. If socialists are able to channel that willingness into an industrial strategy, a plan to head to the shop floor and organize one’s coworkers, we could shake the foundations of the twenty-first century American economy. This August is the twentieth anniversary of the 1997 UPS strike; a strike that defeated one of the most powerful corporations in the world. Now that much more of the U.S. economy revolves around the logistics industry, the 1997 contract campaign and strike looked like the strike of the future. Let’s seize the opportunity. This article assumes a lot in the upcoming UPS/Teamster contract negotiations. Unless the negotiations are conducted with strong rank & file participation, not much will change at UPS. Back in 1981 when I was only 29 I worked briefly as a part time loader at the Houston pub. The production expectation was inhumane and the job was sorely lacking in any opportunity for me. After two weeks I told my supervisor who was constantly harassing me where he could put his stupid job! Work at UPS is neither easy or appreciated. For real change to occur the UPS workers must hang strong and strike during the Christmas rush. Believe me James Hoffa will not give a damn about the lousy working conditions and inhumane production quotas! VICTORY IS POSSIBLE IF TEAMSTERS STAY UNITED!